We’re smack bang in the middle of some GLORIOUS weekend weather. It’s the inlaws’ last day with us before they head off to New Zealand and then home to England and I know things will get a bit tricky this evening. Before all the tricky we have a day at the beach and a barbecue (we’ve entirely indoctrinated the visiting Poms to the joys of perfection-grilled kangaroo). It’ll be a day of lazy and all about the kids and maybe a stitch or two in between for me. My girl and I are loving the collaboration happening with all the red up there (see, we’re not really up to much mischief – it’s not like we’re yarnbombing a traffic light or stuff). I suspect, I have pushed things a little far with the latest Olearia, broken ALL the rules. I’ve, um, run out of staples. The Olearia pattern runs over quite some number of pages, and the page numbers didn’t print and there are quite a few style options. I sort of lost track of the pages and where I was and after a few days, thought I should maybe consult that pattern properly. I’m happy to say I’m now back on track, after a shrugging of the shoulders and the tacking on of EIGHTY missing stitches into the fifth last row of the bodice section. About thirty rows too late and possibly somewhat abrupt. That stitching!!! what sticth is that? it is so neat!! I am wal impressed. ...and patterns were made to be broken. Loving the look of the strips of red. Hope all goes smoothly for the last day. I have nothing but the upmost faith in you. You mean me, don't you?! Just cos I read patterns and rip stuff back if I make a mistake. I'm boring, I can't help it! Your stuff always looks like you meant it like that anyway. Red + linen + embroidery = yummy. Loving your reds ! I'm glad you popped over today I have been wondering how you were . Without wanting to jinx myself with any premature congratulations, I think I'm finally on track with the Olearia.... although I didn't count stitches (boring! ), it looks ok ..AT BLOODY LAST. I got page numbers. Anyhoo - it looks like you're up to all sorts of loveliness with that young one of yours, and I can't wait to see the results! Oh, I'm sure the Olearia will block out and look fine. The red project looks intriguing too. 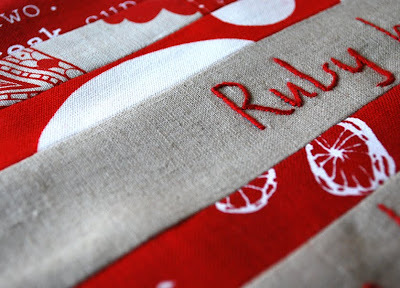 The red and linen looks so great, and the stitching is perfection! I love your knitting-by-the-seat-of-your-pants stories. Pschwah... what's 80 stitches between friends, eh? 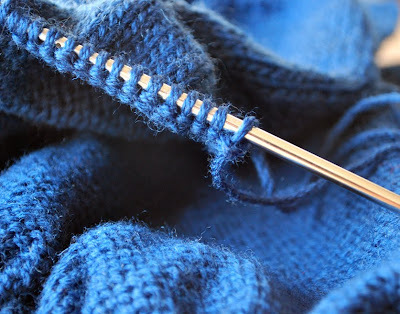 Maybe a instruction guide to how to achieve that most beautiful,even stitching and what thread to use? Yarnbombing a traffic light...now that sounds like fun!! !